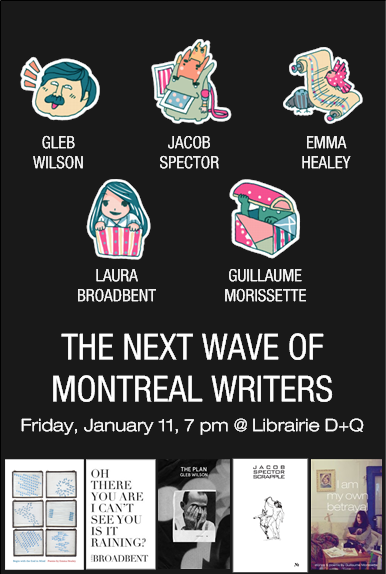 211 Bernard: Our first event of 2013: The next wave of Montreal writers! Our first event of 2013: The next wave of Montreal writers! We're having our first event of 2013, and you are all invited! Join us to welcome THE NEXT WAVE OF MONTREAL WRITERS to the store for a showcase/gathering, on Friday, January 11, at 7pm. John-Paul Fiorentino, of Snare Books, as host. 5x authors, 3x books, 2x chapbooks, all debuts. All alumnis (or soon to be) from Concordia’s Creative Writing program. Highly relatable stories, painfully crafted poems, tweets, hugs, future Heritage moments, dogs, feelings, nervous laughter, Blade Runner, kindness, questionable personal decisions, student debts, trying and failing, people, chairs, other things. It will surely be a bewitching evening. We hope to see you here!